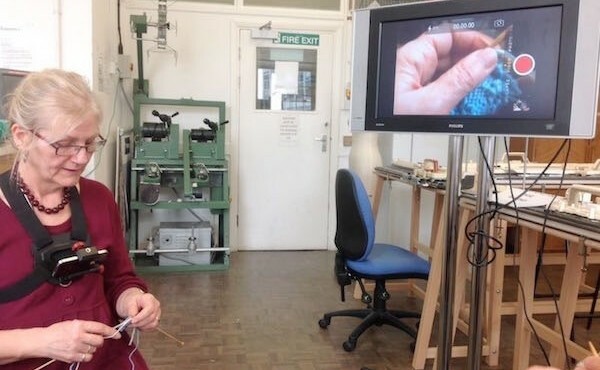 Following on from the HEA event where Vikki showed how she improved visibility of the fine close up work she does on knitting machines, I’ve had several people ask me about how to set the appleTVs up. The answer is… it depends… but I thought it worth sharing my solution. 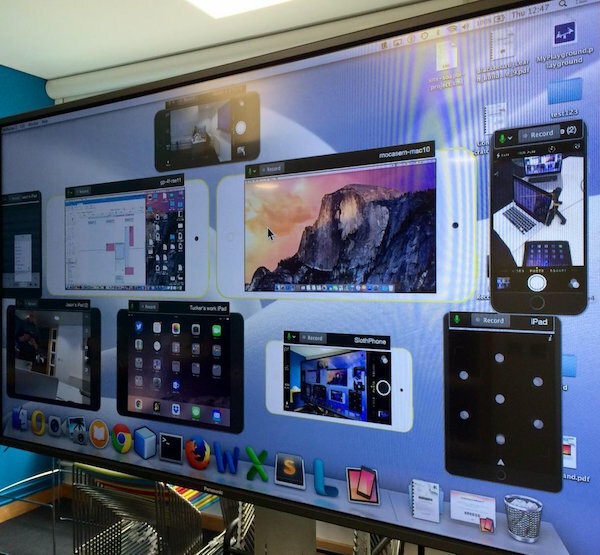 In order to enable “conference room” screen sharing the devices have to be on the same network, which means getting an eduroam account for each of the devices. Policy demands we don’t use a common account for all, meaning each configuration of the device is different, and the profile has to be edited before pushing to the apple TV. 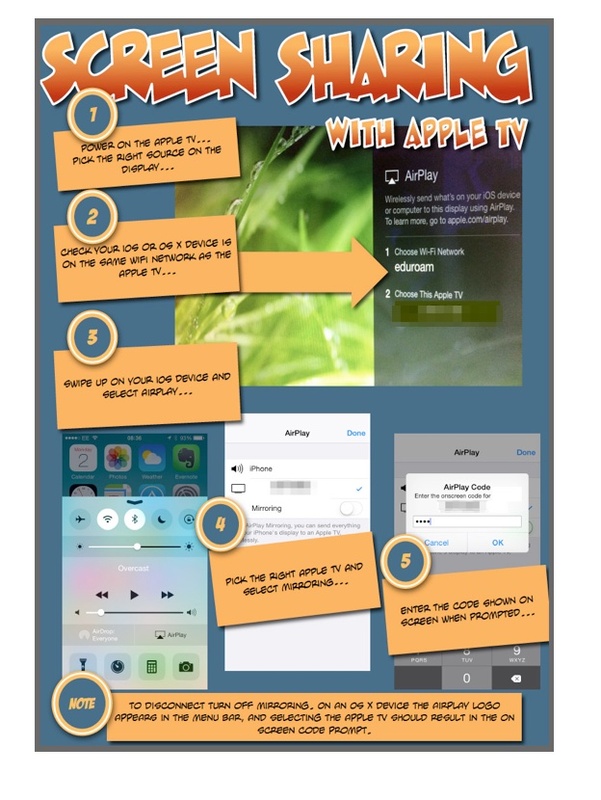 To “build” an appleTV to the required configuration takes about 20 minutes plus testing, and final “lock down” where additional or superfluous items are removed from the home screen, and the device is set to default to conference room mode. Less time is required for additional configurations as the latest version of iOS doesn’t have to be pushed to the devices. Set up and installation of the devices has proved problematic for a number of reasons. 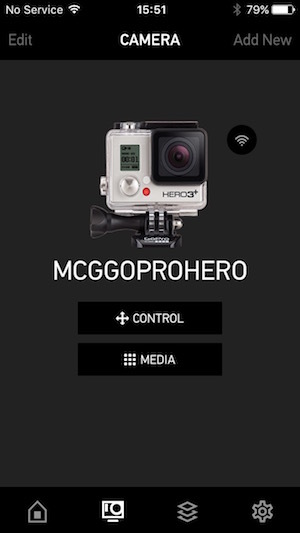 Whilst much of the setup can be done through the “configurator” software the final step requires access to the individual device menus, which means connecting up an HDMI monitor. 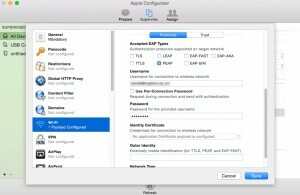 First off you’ll need to get hold of whatever certificates you use on your network, once you have them, select the “Certificates options” in the left hand panel of the configurator and add them using the + button. Next select the Wi-Fi menu and set the SSID to eduroam, check the “Auto Join” box, and pick WPA/WPA2 Enterprise as the security type. check the PEAP box and and set the Username and Password for the device, this needs to be different for each device. Next select the “Trust” settings, and check all of the certificates you have installed and Save. Connect the appleTV with the USB cable and power up the apple TV. Configurator will launch a pop up “Apple TV Assistant”. e.g. 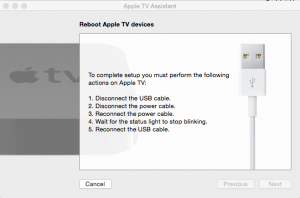 : GP321 appleTV – This can be changed once the device is located using the on screen menus on the appleTV. Once configured you’ll need to follow the instructions, disconnect the usb, disconnect the power, reconnect the power, wait till the LED stops flashing, connect the usb again. With luck you then get a big green tick. The devices can then be further configured using the onscreen menus to enable conference mode with an onscreen password, to hide the unneeded icons, and to set a passcode on the device. Testing revealed that whilst the devices are pretty much uniform, some proved harder to get to the point where they accepted a profile. Some devices required 2 or 3 (in one case 4) attempts before the settings took, there is no clear reason why this should be the case. Deployment has proved complex due to the lack of capacity of the existing infrastructure control panels for auxiliary inputs, and the lack of HDMI inputs at all. This means the likely solution is to plumb the devices in to the PC laptop port using a VGA converter, OR to connect to the HDMI and then use the remote control to select the source. On my site there are no two installations that are completely the same, which means slightly different instructions are required for each installation, and awareness of this difference by those intending to use the devices. This is further complicated by the need for a power supply for the appleTV and more pressingly, a way to cycle the power if the device goes to standby, and needs to be restarted. – Reliability of the appleTV units once active (they often require multiple attempts to connect) may have a considerable technical support overhead. – Configuration of the devices takes a significant time. The biggest barrier to use is the varied connection to the screens. A common approach at least within a campus would be beneficial. Free roaming devices, with HDMI cable and VGA/HDMI adaptor for personal use. Connection by HDMI cable to modern Flat screen devices. Identify requirement as part of the room refits and agree a common approach, common connections, capacity for future expansion. 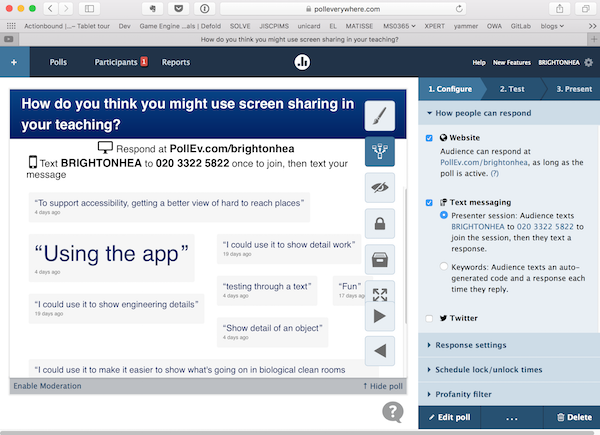 Review common software alternatives – use of reflector,(I’ll write up Reflector details shortly) or air parrot for laptop users and a solution for fixed desktop units. Look at design of the instructions to provide concise, clear common approach. Work with Learning Technology Advisors, site technicians and school technicians to ensure awareness, and support capacity and capability.